Why can't I access/connect to my cloud hosted MIDAS! If you're ever enable to access your cloud-hosted MIDAS booking system, please check our dedicated Service Status page and Twitter Feed (@mid_as) in the first instance. Our network and infrastructure are monitored 24/7, and our Service Status site is automatically updated if problems are detected. In the extremely rare event that an unforeseen issue arise with our systems or infrastructure, we will also endeavor to provide further regular status updates through both our dedicated Service Status site and Twitter feed. Therefore, if you're ever unable to access your cloud hosted MIDAS booking software, our Service Status page and Twitter Feed should always be your first ports of call. Planned maintenance events will also be announced in advance on our Service Status page and Twitter feed wherever possible. If there are no recent Service Status updates on our Twitter Feed, and no issues reported on our Service Status page, then please try checking whether your MIDAS domain is inaccessible for everyone, or just you, by using a website such as downforeveryoneorjustme.com or downornotrightnow.com. These third party websites attempt to connect to a website you specify (i.e. your dedicated MIDAS domain), and report whether they were able to establish a connection or not. As per the Terms & Conditions for cloud-hosted MIDAS systems, we reserve the right to temporarily suspend access to cloud-hosted MIDAS systems, without prior notice, should we detect, receive reports of, or be concerned about abnormal usage or suspicious activity, and/or activity which could degrade or otherwise adversely affect the quality of service we provide to our other "hosted" customers. Please try accessing your MIDAS software via a different internet connection (i.e. that has a different IP address). If you're able to successfully connect via a different IP address, please contact us with details of the original IP address that you believe may have been blocked, and we'll be able to advise accordingly. If monitoring sites show your MIDAS scheduling system as being "offline/down", please be patient - our network and infrastructure are monitored round the clock, and our dedicated Service Status page will usually automatically update within a few minutes of an issue being detected. As soon as we have any additional information to convey we will do so through our Service Status page and/or via our Twitter Feed. If your MIDAS system remains inaccessible for an extended period, you've checked that it's not a local problem (as described above), and there are still no updates on our Twitter Feed, and our Service Status page reports no issues, then please do contact us. After you've contacted us, do continue to keep your eye on both our Service Status page and Twitter Feed for further updates. If the problem you've reported is affecting a significant number of hosted customers, or our email systems, we may be unable to reply to individual emails as quickly as we can provide updates to all affected customers via our Twitter feed and Service Status page. 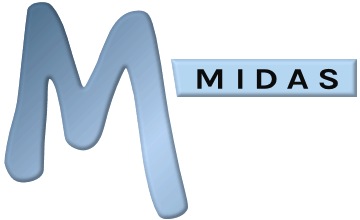 If you're concerned about the possibility of downtime, you may be interested in our Emergency Access Addon for your MIDAS system which will allow you to access a real-time backup of your MIDAS system during any such network/server related downtime.